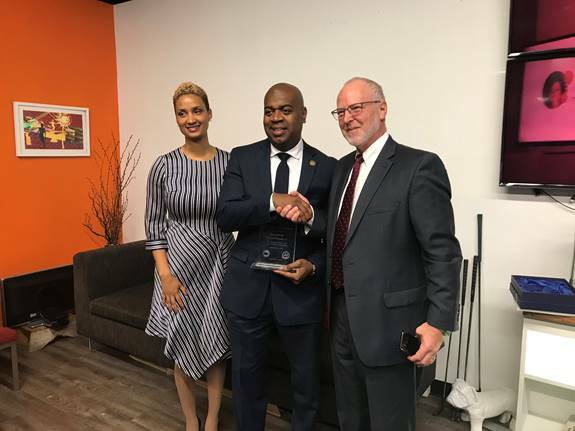 Mayor Ras J. Baraka was awarded the US Conference of Mayors, Partner America 2018 “Small Business Advocate Award” at a ceremony this morning at =Space, at 2 Gateway Center, in recognition of his commitment and work to support Newark’s small business community in the city. The award is given by Partner America, a public-private partnership that was created by The US Conference of Mayors to assist mayors in providing the resources and information small businesses need to thrive within their local communities and the global economy. The Mayor was recognized for his innovative programs to strengthen small businesses including Shop Newark, Moms who Hustle, retail incubators, shared neighborhood storefronts for retail entrepreneurs, preferences for small contractors in tax-abated development, training small businesses on how to secure City contracts, developing a comprehensive database of local businesses to enable anchor institutions to buy locally, teaching small construction companies how to become developers, and more. The Partner America Program is a United States Conference of Mayors small business initiative to provide Mayors with best practices, information and support to help grow and sustain local businesses. The committee is co-chaired by Kansas City Mayor Sly James and Burnsville Mayor Elizabeth Kautz. Past recipients of this award include Philadelphia Mayor Jim Kenney, Austin Mayor Steve Adler, Baltimore Mayor Catherine Pugh and Columbia Mayor Steve Benjamin, among others. More information about the program is available at www.partneramerica.com. The U.S. Conference of Mayors is the official nonpartisan organization of cities with populations of 30,000 or more. There are nearly 1,400 such cities in the country today, and each city is represented in the Conference by its chief elected official, the mayor. Like us on Facebook at http://facebook.com/usmayors, or follow us on Twitter at http://twitter.com/usmayors. PartnerAmerica™ is a unique, small business growth program developed by American Management Services, Inc. and the U.S. Conference of Mayors. Formed in 2000, the program is the nation’s first public-private small business resource initiative, providing management expertise, technical assistance and educational opportunities to small businesses across the country.